From Pro Se Productions, the leader in New Pulp and Genre Fiction, and the creative mind of Author Jerry Kokich explodes the debut adventure of Michael Gordon, The Occultist as a high quality audio book produced by Radio Archives! 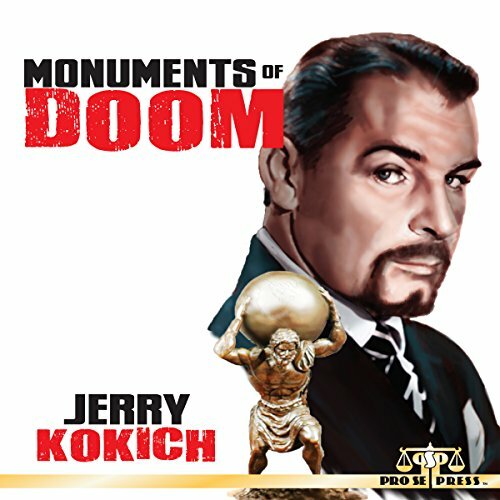 MONUMENTS OF DOOM brings the breathtaking action and nail biting adventure of classic Pulps and movie serials screaming into New Pulp today. Michael Gordon once loved Aurelia Desantis, until she discovered ancient mystical rites of immense power in an archeological dig in Mexico. Gordon realized then just how dangerous she really was. Upon their return to the United States, he told their superiors, his actions leading to her expulsion from the University of Chicago. That day, Aurelia Desantis vowed her traitorous lover would pay. Years later... New Year's Eve, 1939. A statue suddenly comes to life and carves a bloody swath through unsuspecting revelers. A cryptic note arrives at police headquarters, and Michael Gordon, now an occult researcher and advisor to law enforcement, realizes the worst. Aurelia has returned, bent on revenge. Using her arcane powers to animate lifeless statues, she uses them to turn New York into a slaughterhouse, knowing only Michael Gordon has the knowledge to combat her monstrous creations. But, will he use the same deadly rites and incantations, risking his very soul, to stop Aurelia? Can he go down the same dark path without succumbing to the temptations that drove his former lover to madness? Michael Gordon has no choice as he prepares to face MONUMENTS OF DOOM! This explosive New Pulp audio book is also available on Audible and Itunes. MONUMENTS OF DOOM is available at Amazon and www.prose-press.com. RIDE INTO THE MASKED WEST WIRED FOR SOUND! ‘THE NEW ADVENTURES OF SENORITA SCORPION’ NOW AVAILABLE ON AUDIO!